"Picturing the Americas: Landscapes from Tierra del Fuego to the Artic"
With its craggy mountains, unspoiled forests, wild rivers, vast prairies and open sky, the immense territory that makes up the Americas was bound to kindle the imagination of artists. Notably, while early portraiture and history paintings on these shores mostly emulated European art traditions, the land inspired the first new movement—the idealized, luminous naturalism of the Hudson River School. That much of art history we know. But what of landscape traditions throughout the Americas? "Picturing the Americas: Landscape Painting from Tierra del Fuego to the Arctic," an exhibition organized by the Pinacoteca do Estado de São Paulo, the Art Gallery of Ontario and the Terra Foundation for American Art, is the first attempt to explore that terrain. From its start, this exhibition indicates that it intends to illustrate how artists used landscapes to make statements, rather than how they created them or their relative artistic merits. The works—more than 100 paintings and works on paper from the 19th through the early 20th centuries—are presented as tools that forged or reinforced opinion about nationhood, cultural identity and the environment, natural and (later) built. They may be aesthetically pleasing, but they all contain messages, overt or subliminal. Thus, the first gallery here at Crystal Bridges Museum of American Art is filled with seven paintings that helped shape national identity, beginning with Albert Bierstadt's light-bathed "Yosemite Valley" (1868). President Abraham Lincoln had designated the area as a park in 1864, at least partly as a sign of hope during the Civil War. Moreover, paintings of the glorious West like this one helped solidify support for Manifest Destiny. The other, far less familiar works here depict unique natural features important to other countries. Rafael Troya's "Cotopaxi (View of the Oriental Mountain Range From Tiopullo)" (1874) shows one of Ecuador's active volcanos, which on clear days is visible from Quito, while Felix Emile Taunay's "Guanabara Bay Seen From Snake Island"(1828) shows Rio de Janeiro as a bustling port, converted from a small town by the imperialist Portuguese. 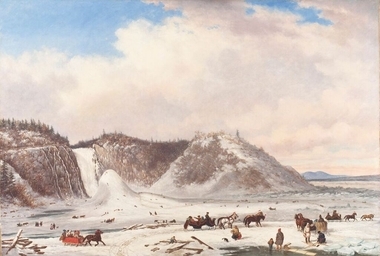 Cornelius Krieghoff's wintry "Montmorency Falls" (1853) captures a cultural landmark in Quebec. Adding to its natural beauty is a swarm of sleighs and toboggans—people having fun in a Christmas-card fantasia. These or similar works circulated widely as prints, encouraging development of the Western Hemisphere. "These are not neutral images," the wall label asserts. Before moving on to the inevitable subjects of the displacement of indigenous peoples, territorial battles, exploitation of natural resources and industrialization, the show spends a moment honoring Alexander von Humboldt, the Prussian explorer who exhorted artists to observe nature closely and render it in a scientifically correct manner. His large portrait here (1859) by Julius Schrader sets him on a cliff, notebook in hand, against gleaming white mountains. Artists including Frederic Edwin Church, Paul Kane and Ferdinand Bellermann followed Humboldt into the wilds, sketching for later use. The results are clear in the details of works like Martin Johnson Heade's exquisite "Tropical Landscape With Ten Hummingbirds" (1870), a distant mountain vista seen through the branches of passion-flower plants. Yet for beauty's sake, Heade chose hummingbirds that would never alight together as shown. Likewise, Church painted "Cotopaxi" (1855) in great detail but inserted nonexistent palm trees because potential buyers expected them. What's missing from other pictures is equally telling. Paintings depicting the march of settlers into land occupied by natives, north and south, often left out the indigenous people entirely. Others, like Worthington Whittredge's "Indian Encampment" (1870-76), presented Indians in peaceful settings, with no sign of trouble, no blood in the soil. There's also no conflict in Pedro Gualdi's "Grand Plaza of Mexico City, Following the American Occupation of September 1847" (1847), even though it shows the city's square after Mexico's defeat in the Mexican-American War. Rather, an American flag flies high above the national palace and business carries on below. That's colonialism: no need for guilt. Artists tended to leave out the bad stuff when they portrayed logging, farming, fishing and other ways people used these lands of plenty. Among the standouts in this section, for the chill it engenders, is Maurice Cullen's "Ice Harvest" (1914). Against a white sky, with a hint of Quebec in the distance, men and horses work on thick blue-white ice of the St. Lawrence River. Many paintings here are new to Americans but shouldn't be. Yet for me, the integrated hanging failed to lead to revelations about the three artistic traditions. Like separate rivers, they seem to flow in disparate courses at different speeds until the very end, with Modernism. The last gallery returns to the theme of the first, with seven pictures, including Georgia O'Keeffe's "Black Mesa Landscape, New Mexico" (1930) and Pedro Figari's "Colts on the Pampa" (c. 1930). By then, though, artists were less interested in realism than in their emotional response to the land, and the nature of national identity was changing as well.